The Navajo Community Planners, Inc is requesting qualified applicants to apply for the open seats in the upcoming Annual Election for the Navajo Community Planning Group. The election will be held 7:00pm, Wednesday, March 9, 2016 at Tifereth Israel Synagogue, 6660 Cowles Mountain Blvd., San Diego, CA 92119. 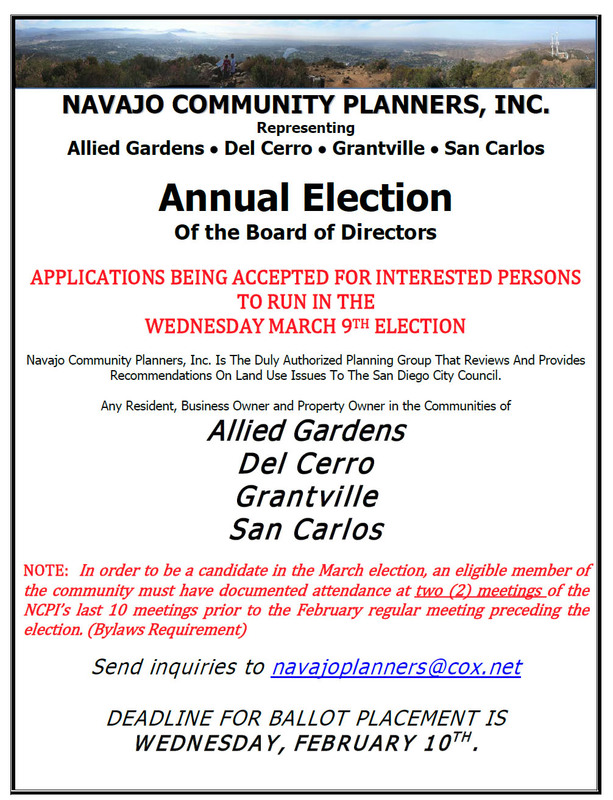 There are TWO open seats for EACH neighborhood in the Navajo Community (Allied Gardens, Del Cerro, Grantville and San Carlos). In order to be a candidate for these open seats, an eligible member of the Navajo community must have attended two (2) meetings of the NCPl during the last 10 months (prior to the Election Date) which can be documented. A completed application must be filled out and submitted by 12 Noon, Wednesday, February 10, 2016 in order for the applicant’s name to be placed on the ballot. If you would like be a candidate for this board position please click here for the application form. The application may be submitted via email by the due date to navajoplanners@cox.net. The Navajo Community Planners, Inc. was formed and recognized by the City Council to make recommendations to the City Council, Planning Commission, City staff, and other governmental agencies on land use matters, specifically concerning the preparation of, adoption of, implementation of, or amendment to, the General Plan or a land use plan when a plan relates to the Navajo community boundaries (Allied Gardens, Del Cerro, Grantville and San Carlos). All members of the Navajo community are eligible to vote at this Election as long as they have proof of identity which may include, but not limited to: a property tax bill, utility bill, valid photo identification or valid and current business license. Further, businesses will be allowed one (1) vote per business for purposes of the election. If an individual meets more than one of the eligibility requirements, then he/she is only eligible to cast one (1) vote. Non-residents property owners or their designees are allowed only one (1) vote per property. This entry was posted in Announcements, Elections by NCPI. Bookmark the permalink.